DO YOU know some history about this park? If you would like to write a short history about this park (from any point in the past), please email us: info@marksearch.org. We would like to include your historical account here. 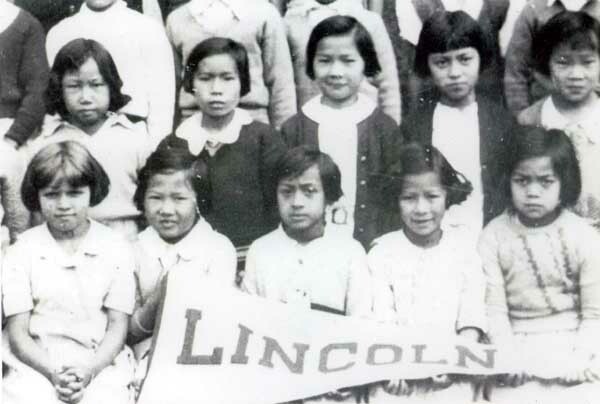 Lincoln Square Park and the Lincoln Elementary school have had a close relationship for many decades. The park has served as the school's playground for generations. The snail race, an event that was started in the late 1960s in honor of St. Patrick's Day, has remained a very popular annual tradition at Lincoln Square Park. Apparently, St. Patrick had the ability to rid Ireland of all its snakes. But since snakes weren't readily available, Lincoln turned to snails. Read here to learn more about this unusual Lincoln tradition! This two-acre park bore the name of Oakland Square until the anniversary of the birth of Abraham Lincoln in 1898. On February 12 of that year it was renamed Lincoln Square in honor of the great emancipator, in a formal ceremony at which Mayor John L. Davis presided. The occasion was the planting of a young sequoia tree, around whose roots was deposited soil from each of the nation’s forty-six states and two territories; soil also from the Washington, Lincoln and Grant tombs, from the Bunker Hill Monument and the famed Sloats Monument in Monterey. And here the “Lincoln Sequoia” stands today. Nurtured by such cosmopolitan soil, it has attained a height of some fifty feet and is twelve or more inches in diameter. The park was at one time the estate of Chan Bok Hing. Chan was one of the wealthiest men in Chinatown. He owned several lotteries and gambling establishments in West Oakland and San Francisco. His house was torn down in the 1930s one day, and the city took the property and turned it into a park. The people who were living in the vicinity used to sit on the lawn or the bench in warm or hot weather. There were houses on 6th Street facing the park, which were torn down for the construction of the 880 Freeway. It became known as the Railroad Park after WWII, with the installation of an old steam engine and an old passenger car. The park was of little use until the engine and the car were removed. The Oakland Chinese Consolidated Association and the Oakland Chinatown Lion’s Club sponsored the Chinese Garden Project featuring a hall of pioneers, and Sun Yat Sen Memorial Hall. The hall serves as a senior care facility as well as a general social hall. The original park was situated on the land where the Bart Headquarters now sits. The park was moved across the street on the land where houses and Our Savior Episcopal Church use to be. The park was originally used by the white neighborhood. The Oakland Chinese expanded into the neighborhood and began to use the park. Almost every morning, Chinese will assemble in the park to practice their Tai Chi. It’s the only playground for children within the vicinity of Chinatown. There are facilities for children to play baseball, basketball, football, etc. The younger children will play on the slide, the sandbox, and climb on the replica of the Chinese Juuk. The young men will play tennis in the tennis court on weekends. On Sunday afternoon, the young Filipino men used to play volleyball on the grass lawn on the 11th Street side. On Saturday and Sunday, when Chinese parents go shopping in Chinatown, many parents park their young children here under the watchful eyes of the older kids. Lincoln Square is also used by Lincoln Elementary School on school days. During recess or waiting for classes to begin the children will congregate here. Lincoln Square is also the school yard and well used seven days a week. With the construction of the gym, there are more basketball competitions among various teams. The Square is also used on Easter by the Wah Sung Club for the Easter morning brunch, and by the Episcopal Church for the Easter egg hunt. Lincoln Grammar was established at 10th and Alice Street in 1872. It is the second oldest public school in Oakland. It has been in continuous use for almost 136 years. In the year 2000, the former students held a grand reunion, celebrating 128 years of community service. Over 900 former students attended. The school is open to any children within the vicinity of Chinatown. About 80% are Chinese-American. The staff of the school is about 75% Chinese-American and Vietnamese-American. One Chinese-American teacher, the first Chinese-American in the Oakland public school system, is Miss Effie Chew. She rendered invaluable help to the Chinese-Americans entering kindergarten. She can speak both English and Chinese. Most Chinese mothers did not speak English, and there were many apprehensions and anxieties, therefore Chinese was spoken at the home. When their children entered kindergarten, they were able to pick-up English quickly. Miss Chew spent her entire teaching career at Lincoln. There are many teachers in Lincoln who spent their teaching career here—turnover is almost nil. Lincoln Elementary is one of the most highly rated schools in Oakland. “The Chinese have been in Oakland since the 1850s. The early Chinese settlement was not a happy one because they were under constant threat of violence from the Caucasian communities… Chinatown was formed as a sanctuary for the Chinese…Many of the Chinese men had left China because of internal disturbances in China. They came to the United States to mine for gold and later worked on the railroads, built the levees on the Sacramento and San Joaquin River deltas, creating some of the richest farm lands in California. In the 1890s there was a recession. Jobs were hard to get…In San Francisco the Caucasians started blaming the Chinese. The phrase ‘Chinese must go’ was heard. This spread from San Francisco throughout California to the United States Congress. Tougher exclusion laws were enacted…There was meager protection for the Chinese in the court of law. They were classified as undesirable and could not testify against white men. The Chinese began to withdraw into their own enclave for protection…These Chinese enclaves are known today as Chinatowns. The Oakland Chinatown begun in the 1870s. It was first located on First and Castro Streets near the waterfront. Second, it was located uptown on Telegraph Ave, and third on San Pablo Ave between 19th and 20th Street. Oakland was expanding northward and the land where the Chinese enclaves were became too valuable. The city leaders forced the Chinese to move to their present location, on Eighth Street and Webster…[T]he Chinese began to set up family associations, business associations, workmen guilds, district associations and the Chinese American Citizen Alliance & Tongs. These organizations were established to provide mutual aid for the destitute people. From 1924 to 1943 the United States enacted more stringent laws to discourage the Chinese men from bringing their wives and children…Prejudice against the Chinese was in full bloom. Some of the men with college degrees wound up working as waiters, laundry men, gardeners or houseboys. It was almost impossible to get a job outside of Chinatown. During WWII, the Chinese were finally able to leave Chinatown to work in the war industries. They were able to join unions and professional societies and get jobs which were [previously] denied to them. The United States finally removed all the exclusion laws except for the immigration quota of 105 Chinese a year. At the end of WWII, war brides from Europe began to immigrate to the United Sates under a non-quota system…veterans and their wives settled in Oakland. Most of the wives spoke no English so they and their husbands stayed in the vicinity of Chinatown. As they put down roots and children started to arrive, Chinatown started to grow again but housing became critical. The building of the 880 Freeway, the Building of Bart and the Building of Laney College took away much of the housing stock in the vicinity. Prejudice in the better areas in Oakland was still rampant…It was only with the enactment of the Fair Housing Act by Congress that the Chinese were able to expand beyond the boundaries of Chinatown. On September 22, 1960, President Eisenhower signed and amended the immigration and Nationality Act of 1952. The 105 quota for Chinese was changed to be on par with other countries…More Chinese immigrants were able to come to the US under the new Quota. 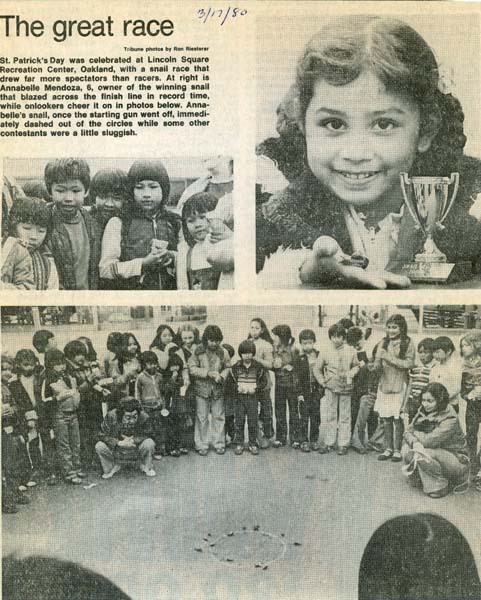 The Vietnam War brought Vietnamese refugees to Oakland, and many Vietnamese settled in the vicinity of Chinatown. Many of these (Vietnamese) were ethnic Chinese and were able to speak the same language as the local Chinese population. They even settled into a new Chinatown of East Lake Merritt. With new blood, Chinatown bloomed into what we see today. More businesses and apartments were built. Today, Oakland Chinatown has become the busiest shopping center in Oakland. Those who moved away from Chinatown still return to shop, dine and meet old friends. "The originators of [the 1853 map of Oakland] this plan had a vision. In a symmetrical arrangement about Broadway as an axis seven blocks were reserved as parks, each block having an area of about two acres. Between 4th and 5th Streets, on either side of this axis, and extending from Broadway both ways to Washington and Franklin Streets were two squares, later named Washington and Franklin. Two blocks to the north of these squares between 6th and 7th Streets, and three blocks east and west of the Broadway axis were Harrison Square, between Harrison and Alice Streets and Jefferson Square, between Jefferson and Grove [present-day Martin Luther King, Jr. Way]. Two blocks further north, between 8th and 9th Streets, and six blocks east of Broadway was Caroline Square [present-day Madison Square], between Julia (now Madison Street) and Oak Streets. The corresponding square to the west was not reserved, possibly because it was near the western edge of the survey and 'way out' in the country. Four blocks directly north of Jefferson and Harrison Squares, between 10th and 11th Streets, were Lafayette and Oakland [present-day Lincoln] Squares."